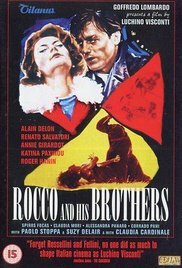 After the death of his father, Rocco Parondi (Alain Delon), one of the five sons of a poor rural Italian family travels north from Lucania to join his older brother Vincenzo in Milan, led by the matriarch Rosaria (Katina Paxinou). She is the "hand to which the five fingers belong" as she states in the film and she has a powerful influence on her sons. Presented in five distinct sections, the film weaves the story of the five brothers Vincenzo, Simone, Rocco, Ciro and Luca Parondi as each of them adapts to his new life in the city. Read more on Wikipedia.